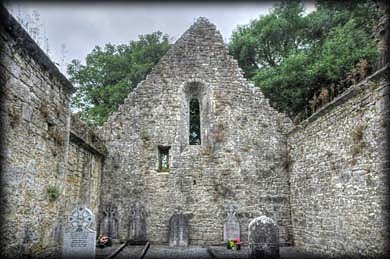 Situated in Mollaneen townland this early Christian monastery was founded by St Tola in the 8th century. Most of the remains are from the 12th century. These include a round tower, St Tola's high cross and this superb romanesque church. The nave and chancel church is over 30 metres in length and has three lancet east windows, inserted in the 13th century, a the single round headed west window, pictured left, and several smaller lancet windows in the north and south walls. . The chancel arch is rather plain compared to the stunning romanesque doorway in the south wall. 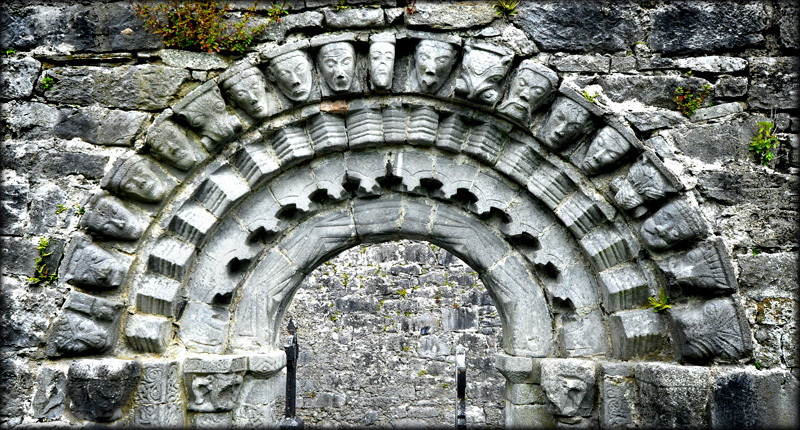 The doorway has four elaborately carved orders. The fourth or outer order is one of the most stunning in Ireland. It has 19 heads/masks, twelve human and seven beasts. The other three orders are decorated with wonderful geometric designs. Some of the capitals feature carvings of horned beasts. This is one of the most impressive areas I have visited in Ireland. It has more than it's fair share of Irish Antiquities. 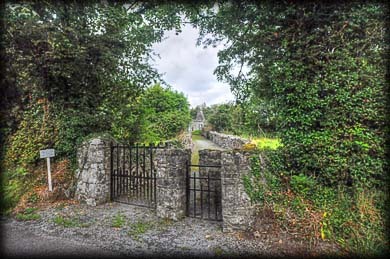 The Clare Archaeological centre is located at Dysert O'Dea Castle, where a guide/map can be obtained, featuring all the 25 original monuments featured on on a 5 kilometre trail surrounding the monastery. A note of warning. There is usually a bull present in the same field as the high cross. Situated: From Ennis head northwest on the N85. After 2.5 kilometres turn right onto the R476. Then 4.7K turn left (Signposted Dysert Church). The site is 2.1K down here on your right. Discovery Map 57: R 2812 8479. Last Visited Aug 2014.